Continuing to sell most of my videogame collection in order to make space / pay for house renovation. 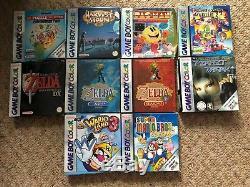 Here are 10x Gameboy & 10x Gameboy Color games, mostly sought after titles in good condition. 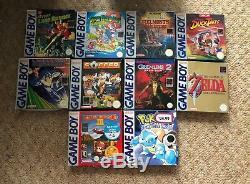 One or two have damaged boxes or missing manuals as specified, but most are in great shape. Super Mario Land 2: 6 Golden Coins. Castlevania 2: Belmont's Revenge (missing manual, box slightly crushed). Megaman: Dr Wily's Revenge. Microsoft Puzzle Collection (box slightly crushed). Pacman Colour Edition (box crushed). Game & Watch Gallery 2. Zelda: Link's Awakening DX (inner cardboard missing). Wario Land 3 (inner cardboard missing). Super Mario Bros Deluxe (inner cardboard missing). I will not reduce / split as this is a reluctant sale. The item "20x BOXED GAMEBOY / GAMEBOY COLOR GAMES SOUGHT AFTER TITLES" is in sale since Friday, September 28, 2018. This item is in the category "Video Games & Consoles\Video Games". The seller is "handsome-vulture" and is located in Southampton.